A stag and doe party is the one final bash before the wedding itself. This is also an ideal time to make some revenue for the couple, so they’d get a good head start on their future life together. Stag and doe parties are the perfect venue for inviting people, those outside the couple’s immediate circle of relatives, whom the couple would like also to inform about the coming union. A function such as this one obviously requires some serious planning, especially if you expect a substantial attendance turnout. The following are a few things to wrap your head around when planning a stag and doe party. The first thing to consider is the size of the targeted attendance. Everything follows along this line, the budget, the venue, the quantity of food and drinks to be purchased… if, for example, you are aiming at accommodating three hundred people, and you want to do it within an affordable budget, find a hall which accommodates that number as much as possible; even if the ideal number of people does attend the function, they will come and leave at random hours of the event, and consequently, you’ll do better if you go with a hall which affords more sufficient elbow room for intimacy, while not being too spacious as to discourage people from participating in dancing or in games. Some halls prohibit the collection of revenue from alcoholic beverages, so be definite about the hall’s restrictions before you choose them as a venue. Usually, the wedding entourage takes on the responsibility of hosting the stag and doe party, but if they are themselves busy or unavailable at the moment, you’ll need a lot of help in putting it together. Focus special attention on the people tasked with selling the tickets; choose those with amiable disposition, and have excellent people skills. The success of the party may depend on them. You’ll need people stationed at the front door, the bar, the gaming tables, the 50-50 draws (the revenues of the draw is divided equally between the winners and the couple), the refreshment stands; you’ll also need extra people to relieve them. 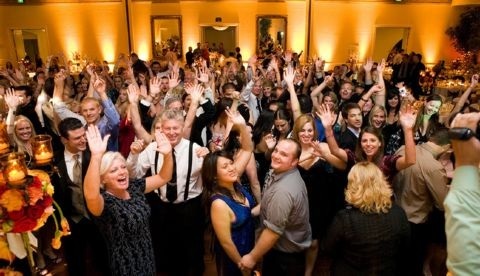 You need to price the entrance tickets reasonably (this depends upon the area where the function is held), if you are expecting 300 people to attend, your target sales should be about 400, since many people will buy tickets just in support of the couple, without the intent of attending the party itself; others also fail to come for various reasons. Hire a live entertainment for the evening, preferably a band that can play a wide variety of music genres. Have a contract ready for signing, stating the price and the length of their evening performance. Have an assortment of door prizes on hand, from gift baskets to free liquor and food stubs, to homemade baked goods and preserves. Refreshments need not be expensive; salads, finger rolls, sweet breads and chips are enough to last for the entire night, since people who attend the event may also bring in food to share. If the party is alcohol-free, then a big bowl of punch in the middle of the buffet table would be ideal, with a back up of soda or water options. Finally, have an arsenal of intermission games handy, in order to fill in the gaps between dance sessions, or as entertainment between the raffling segments for the door prize. Games, such as a ‘bring me’ competition, should be funny, and should encourage people to participate actively.